Our current paradigm of insulin resistance is that of a lock and key. Insulin is a hormone that acts upon a hormonal receptor on a cell surface in order to have an effect. This is often referred to as lock and key model. 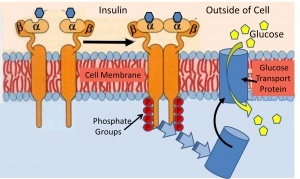 The lock is the insulin receptor which keeps the gates to the cell closed. When the proper key (insulin) is inserted, then the gate opens to let glucose from the blood inside the cell. This glucose is then able to power the cell machinery. Once you remove the key (insulin) then the gate closes back up and glucose in the blood is no longer able to go inside the cell. What happens during the phenomenon of insulin resistance? Classically, we imagine that the lock and key no longer fit very well. The key (insulin) is able to open the lock (receptor) but only partially and not very well. As a result, the glucose is not able to pass through the gate normally. This results in lower than normal amounts of glucose inside the cell. The glucose, which is now blocked by the closed gate, piles up outside the cell in the blood, which we can detect as elevated blood sugar and make the clinical diagnosis of type 2 diabetes. This has also been described as a state of internal starvation since the cell has little glucose on the inside. The knee-jerk reaction is for the body to increase production of insulin (key). Since each key works less well than previously, the body over-produces the number of keys to make sure that enough glucose goes into the cells. A nice neat theory. The problem, really, is that this paradigm does not really fit reality. First, is the problem the insulin, or the insulin receptor? Well, it’s really quite easy these days to look at the structure of insulin and the structure of the insulin receptor of insulin resistance patients. You simply isolate the insulin or some cells and check their structure with fancy molecular tools. It immediately becomes clear that there is nothing wrong with either the insulin or the receptor. So what’s the deal? The only remaining possibility is that there is something that is gumming up the system. Some kind of blocker that interferes with mechanism of the lock and key. But what? There’s all kinds of theories. Inflammation. Oxidative Stress. Advance glycation End Products. All the usual buzzwords that come out when doctors have really no idea. With this model, we have no real friggin’ idea what caused the insulin resistance. Without understanding what causes IR, we have no chance of treating it. Then there’s the central paradox of hepatic insulin resistance. Let me explain. Insulin has two major actions on the liver. Remember that insulin goes up when you eat. It tells the body to stop producing glucose in the liver (gluconeogenesis) because there is lots of glucose coming in from the stomach (food). This is mediated through the FOX01 pathway. The second major action in the liver is to increase the production of fat (De Novo Lipogeneis (DNL)). This is to deal with the incoming flood of glucose that the body can’t use right way. This is mediated through the SREBP-1c pathway. So, if the liver becomes insulin resistant, then the effect of insulin should drop for both of these actions. That is, the liver should continue to make glucose, and stop making fat. But that’s only the case for gluconeogenesis. That is, during insulin resistance, the liver continues to make new glucose as expected. But DNL (making new fat) continues and actually increases. So insulin’s effect on DNL is not blunted but accelerated! How in seven hells can this insulin resistant liver selectively be resistant to one effect of insulin yet accelerate the effect of the other? In the very same cell, in response to the very same levels of insulin, with the very same insulin receptor? That seems crazy. The same cell is insulin resistance and insulin super-sensitive at the same time! We need a new paradigm of insulin resistance that better fits the facts. In fact, we can think of insulin resistance as an overflow phenomenon, instead of a lock and key one. 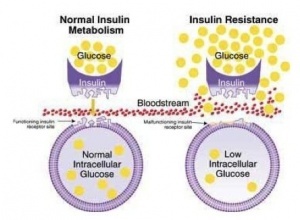 All we really know about insulin resistance is that it is much more difficult to move glucose into an ‘insulin resistant’ cell than a normal one. But this does not necessarily mean that the door is jammed. Instead, perhaps the cell is already overflowing with glucose and therefore more glucose cannot go in. Imagine the cell to be a subway car. When the door opens, the passengers on the outside (glucose in the blood) march in a nice orderly manner into the empty subway car (cell). Normally, it doesn’t really require much of a push to get this glucose into the cell (insulin gives the push). But during insulin resistance, the problem is not that the door does not open. The problem, instead is that the subway car (cell) is already overflowing with passengers (glucose). Now the glucose outside the cell simply can’t get in and is left crowded on the platform. 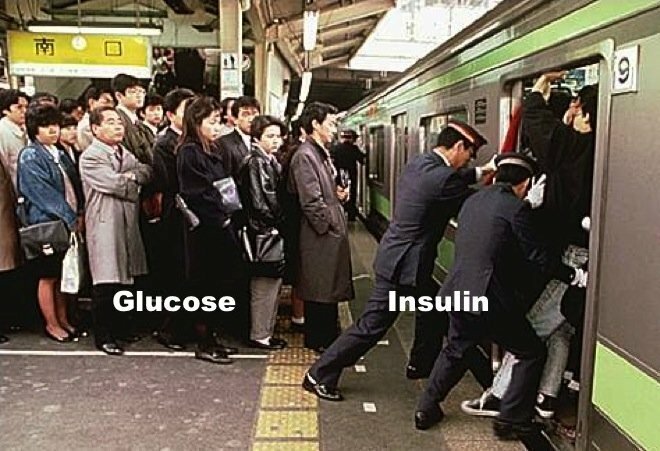 Insulin tries to push the glucose into the cell like the Japanese Subway Pushers, but they simply can’t do it because it’s full. So, it looks like the cell is resistant to the effects of the insulin, but really the problem is that the cell is already overflowing. So, the knee jerk reaction is to manufacture more insulin (pushers) to help push glucose into the cell. Which works, but only for a while. So, the cell is not in a state of ‘internal starvation’. Instead, the cell is overflowing with glucose. Glucose starts spilling out into the blood, which looks like gluconeogenesis has not been stopped which is consistent with insulin resistance. However, the Insulin and its Receptor are fine; they are simply overwhelmed by exogenous glucose ‘toxicity’. But what happens to fat production? In the classic model of insulin resistance, the paradox was that DNL was enhanced, not decreased which looked a lot like heightened insulin sensitivity instead of resistance. But in the overflow model, the DNL would be enhanced because the cell is trying to rid itself of the excess glucose by producing extra fat. The cell is overflowing and not in an ‘internal starvation’ mode. Why is this critically important? Because understanding this new paradigm will lead to the answer of how insulin resistance develops and what we can do about it. The problem does not lie with either insulin nor the insulin receptor. Both are normal. The problem is that the cell is completely stuffed full of glucose. So, what caused it? The answer then seems obvious – it’s a matter of too much glucose and too much insulin. In other words, it was the insulin itself that caused the insulin resistance. We don’t need to chase shadows looking for some mysterious cause of insulin resistance. Once we understand that excessive glucose and excessive insulin is the cause of the insulin resistance, then we can now devise a rational treatment. Reduce insulin and reduce glucose. Once you reverse the insulin resistance, you cure the type 2 diabetes. This is amazing! If cells are overflowing with glucose wouldn’t it be a great idea to start exercising and make sure the glucose in these cells are burned? What a novel idea; reckon the doctors will ever catch on? Fasting works even better. What if we combined the two??? “What a wonderful world this would be”. Are there any actual studies of fasting+exercising? Krista Varady did a study that appears in the October 2013 edition of Clinical Nutrition about combining alternate day fasting with endurance exercise. She was specifically focusing on coronary heart disease risk factors, but did find that weight loss was greater in the fasting + exercise group vs. the just fasting group or just exercise group. As we would expect, just fasting had significantly more weight loss than just exercising. Keep in mind that this was her version of alternate day fasting, which includes up to 500 calories on “fasting” day and eating whatever you want on “feast” days. Hard to say exercise is useless. An hour of moderate effort on the elliptical or the treadmill burns 800+ calories for a 200 lbs man. At higher intensities, or weight training for that matter, you’re likely shifting your own bodies hormones, not just insulin. Maybe its about time spent. Fasting is 24/7 activity but exercise is usually just max 1hr daily and many people cannot even tolerate that level of exercise. But in the long run, exercise will have more powerful effect as more and better muscles will increase the basal metabolic rate. Where are the studies showing that in DB-2 /insulin resistance cells are not starving of glucose (like they do in DB-1)? would also explain why patients get worse and die sooner with more intensive insulin treatment, the outcome of various trials, the ACCORD trial that showed increased mortality with more insulin, for instance. This is a little bit against the spirit of this blog, but does anyone have an idea if it’s better to have dessert before or after the meal? I’ve been thinking it’s better to have dessert earlier in the day, then find a way to walk it off. For instance, we’re going on vacation soon and will likely have ice cream with the kids. We used to always have ice cream after dinner, but I’m thinking we should have it perhaps after lunch, then go do something (go hiking, walk on the beach, etc.) to use up the excess glucose. And, of course, fasting after returning from vacation works well too. It all hinges on what you mean by dessert. If it involves sugar and floury baked goods then the answer is NO DESSERT FOR YOU. Never having another dessert is unlikely and impractical as a suggestion. I have dessert A LOT. I’m just saying. I started having recognizable symptoms of alzheimer. Going keto with zero carbohydrates became much easier and very practical. Fast days are for fasting. Feast days are for feasting. Interesting theory. One thing that it doesn’t explain though is the fact that many T2D:s on LCHF still need some medication. Why is that If there is no structural problem with their insuline receptors? Could there be a different mechanism for liver cells vs. peripheral cells, or do you think one mechanism can explain both? This is a great explanation! When cells get crammed with glucose for a long time, what happens? Fermentation starts. You got cancer! This fits so well to everything else, it must be right. What an astonishing logic you have, Dr Fung! Great post. Dr. Fung’s the best. I’m enjoying the heck out his book. Thanks Doctor. Reaction rates very much depend on the concentration of the reactants. If you get too much product, then things slow down or even reverse. This is all basic physical chemistry and I wonder if there is a lot of research going on to study the chemical pathways in detail and determine where the backups are occurring. It certainly would provide a basis for your theoretical explanation, and would be a lot more satisfying than the lock and key model. Diana- Sonja here. I totally agree with you. pls scan down ~10, and see what I wrote! something more is going on. Is there any way to develop a test or study that could prove this hypothesis correct and the original hypothesis wrong? Sort of like swallowing bacteria and getting an ulcer to prove that (some) ulcers are caused by bacteria? Zig, thanks in particular for comment #1. I was specifically trying to work out the “internal starvation” aspect in my own mind. This is quite helpfull. 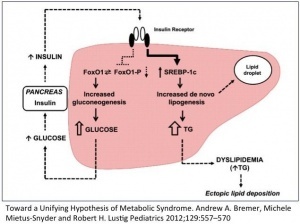 Regardless of the inherent limits of explicating complex interdependent functions, would you agree that nutrition systems (like periodic fasting) which lower insulin levels remain sound approaches to modern metabolic diseases? And/or, that tracking insulin levels is a good proxy for predicting current and future metabolic health? Yes, maintaining adipose insulin sensitivity for feeding and their physiologic insulin resistance for fasting is crucial. Both a low insulin load diet and fasting help. No major disagreement in that part. I hope Dr. Fung does an indepth study on statins since I know first hand that my husband’s glucose bloodwork was fine but one year on statin (lipitor) his glucose was 116-prediabetic. I’m tired of a cardiologist just wanting to treat one problem but has no regard that his prescription is creating another life threatening illness. Hmmm, lower cholesterol or give a patient diabetes??? Watch “Sunday Housecalls” on Fox cable and see Dr. Samadi’s response!! I agree with his advice. I hope Dr. Fung addresses this issue head-on. Specifically about statins and diabetes. Thank you ! You do not need indepth studies ! Just google: pfizer sued lipitor causing diabetes 2, and you find that 1000’s of people are in the same seat as your HB. Please also show prints of the articles to your cardiology geniuses, as many of them rarely get new information from others than statin/meds salesmen. The problem for Pfizer is that they knew this long before they later had to warn people about it. The serious crime is in knowing to cause harm and pushing on with sales saying nothing. I love this analogy! It makes much more sense than the lock and key idea. I’ve been on the metro in Moscow, Russia. There were no pushers that I recall, but one day, during rush hour, we were packed in so tight that I was lifted off the floor part of the time. To think I’ve done this to my cells…it’s no wonder sometimes I hurt for no apparent reason! I have no energy either! Been that way for years. Back when I was 30, my 80-year old grandma had more energy than I had! … However when I fast my energy goes up. I am not obese but I am insulin resistant. If part of your cell making energy involved moving material from one side of the cell to the other, how well would it be able to move that material if it was packed in tight? If you made energy by walking from one end of the subway car to the other, and the amount of energy you created was determined by how fast you moved, how fast would you be able to move if the subway car was so full they needed “pushers” to get you into the car? Anecdotally: my wife has a pulse oximeter. On a normal diet I am around 93-94 on oxygen saturation. While low carb of fasting I am at 98%. I also notice myself breathing slower and more shallow. Makes sense, thanks. However one question – if the cell is not in a state of ‘internal starvation’ why do those with IR get hungry? Thanks in advance! Martin (above comment) says it’s like having molasses in our cells. That could make sense. Oops this reply was to Sonya’s comment. Sorry. Wow that is just criminal! Hope she stays strong, and finds a new doctor! France also eats a lot more fat. Frois guas and cheese. Also their portions appear comically small to us Americans. Are there a lot of fat-free productd in France? Don’t forget too that here in the US they have added Bromine to flour and bread products which is toxic and clogs the hormone receptors. Which translates to iodine receptors being clogged coupled with no iodine in the diet any longer. Iodine is used by every cell and hormone receptors. They should outlaw this as other countries have done . I think its a multi-layered problem along with insulin resistance. “What if it were the mitochondrion machinery that is impaired ? I think those are very interesting questions! Another EXCELLENT Blog…. I look forward to them like a kid at Christmas and am never disappointed! This is a bit off topic but has anyone had an increase or decrease in kidney stones on a LCHF diet. Just curious. Congratulations Jochy, that’s a great story, you’ve dropped 34 lbs in 8 months if I’m following your timeline correctly, a steady rate of approximately ~1 lbs per week, and you’ve gone from size 40 to size 34 pants. Good one David! LOL And congrats Jochy! My husband and I have done the same thing…. slow and steady wins the race. Amazing JochyD. Good for you! Thank you Dr. Fung, for thinking! Few practitioners go beyond the readily accepted “studies” that have traditionally become the benchmark for our lack of success in the fight against diabetes, cancer and most other health issues. In a brain dead society where early diagnosis and drug treatments are trumpeted as successes you stand out as an example of how our thoughts and beliefs can transform us into sheep or elevate us! Thank you from the bottom of my heart for making the difference for the resistance! You have become the transformer. Should read in the last sentence……….you have become the elevating force! I wonder if you are familiar with the paper linked below. It challenges the idea that insulin resistance is the primary driver of type 2 diabetes, and makes a case for beta cell dysfunction being the primary problem. Any thoughts? prof premraj pushpakaran — 2018 marks the 100th birth year of Frederick Sanger!! !